Our presenters Deirdre Slattery (LaTrobe University) and Ian Higgins (North Central CMA) provided a general understanding of where participants and their property fit within the local and regional landscape (including landforms, geology, land use history, vegetation) and explored issues around improving biodiversity. 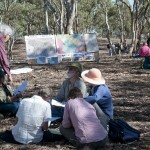 We explored how historical factors have shaped/will shape the current and future land use activities on this site, used vegetation classing as one example, and provided information, tools and skills to assist interpreting the local landscape. 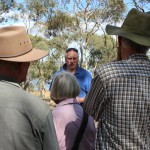 Importantly, we considered landholder management aspirations in this context. Many thanks to Brian and Robin Rebbechi for allowing us to use their property as the venue – and focus – for the session, and for their hospitality. 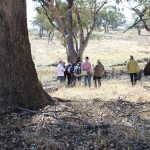 A beautiful late autumn day greeted twenty four participants to Robin and Brian’s 40 hectare property at Cairn Curran. 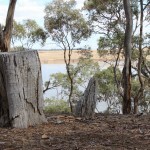 We gathered under the yellow gums on a ridge overlooking what was once the mighty Loddon River, and is now of course the Cairn Curran reservoir, to consider the “Big Picture” of biodiversity, land management and native revegetation. The day was divided into an historical investigation and an ecological analysis with two highly knowledgeable and enagaging presenters. It wasn’t just a matter of sitting and listening though! Both presenters had participants fully engaged in small group exercises using a range of resources, and in larger group discussions new knowledge was gained and actively explored. 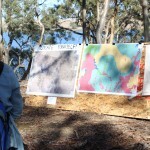 Deirdre Slattery presented a fascinating trawl through the settlement history of the area, and had participants conduct on-the-spot research through her considerable resources to discover the history of Robin and Brian’s property. 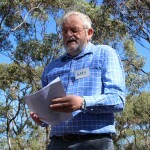 Through Deirdre’s investigative research at the Land Title’s Office we learnt that the last of the squatters applied for a licence on what was then a huge run of about 21,000 acres from Werona to Baringhup. The first lease is recorded in 1884 by a G.Crockett. 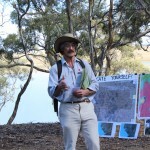 The impact of the 1852 gold rush in nearby Castlemaine resonated widely, as failed gold diggers and miners relocated and took up farming, with an emphasis on clearance, and public land was sourced for timber. 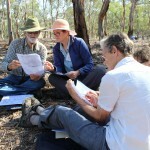 Participants discussed this social movement in terms of its impact on Robin and Brian’s land. 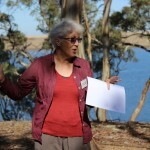 Deirdre talked about the impact of political legislation on the environment from the original division of the land into 40 acre settlement parcels, to the ad hoc use of land prior to the 1978 Land Conservation Council and the current focus on limiting fragmentation and preserving native vegetation. Ian Higgins of the NCMMA started by giving us some bleak statistics about the human population’s unsustainable drain on resources and the global rate of extinction of flora and fauna. Australia unfortunately leads the world here – over 20 extinct mammals in the last 160 years. 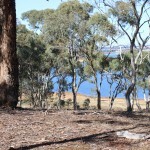 While Victoria is the most over cleared state, it is also something of a leader in addressing this, with a gradual change in attitude towards preserving native vegetation not because of a threatened species but because of its overall biodiversity. 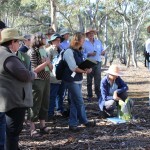 Ian introduced participants to the basic principles of Victoria’s EVC (Ecological Vegetation Class) model comprising Status (endangered, threatened, depleted, of least concern); Condition (diversity, age range, recruitment etc) and Significance (value). 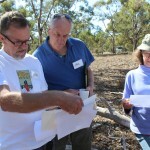 Participants then engaged in their own EVC assessment of parts of the property, looking at soil type, topography and vegetation. The day concluded with rotating groups discussing the impact of history on the landscape, how the EVC can be used to understand and implement management actions, and a science fiction scenario of what we might see in 100 years time!